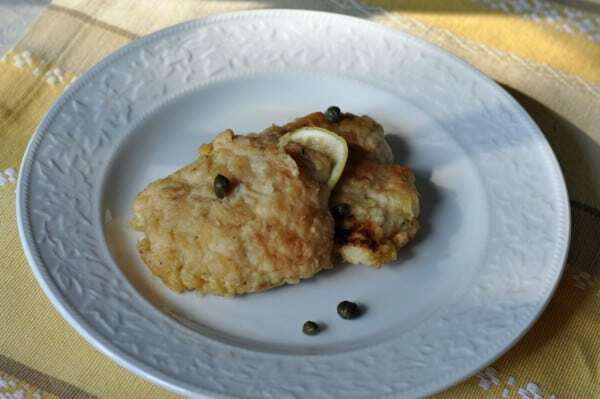 Home » Chicken Recipes » Amazing Chicken Fricasee – you can make citrus chicken for dinner. Amazing Chicken Fricasee – you can make citrus chicken for dinner. Lemon chicken that is so simple to make and tastes awesome! This is very easy for anyone that doesn’t really cook often! Thanks to tonibunz for sharing this recipe. You can turn ordinary chicken breasts into something amazing with this white wine and citrus sauce. n a wide bowl, beat the eggs with 3 tablespoons of water to make an egg wash. Heat the oil over medium-high flame in a large skillet. Dredge both sides of the chicken cutlets in the seasoned flour, and then dip them in the egg wash to coat completely, letting the excess drip off. When the oil is nice and hot, add the cutlets and fry for 2 minutes on each side until golden, turning once. Remove the chicken cutlets to a large platter in a single layer to keep warm. Toss the lemon slices into the pan and cook for 1 to 2 minutes, until fragrant. Add the wine, broth, and lemon juice, simmer for 5-7 minutes to reduce the sauce slightly. Roll the butter in some flour and add it to the skillet, this will thicken the sauce. Stir to incorporate and dissolve the flour. Reduce the heat to medium-low and return the chicken to the pan; place the lemon slices on top of the cutlets. Simmer gently for 2 minutes to heat the chicken through. Season with salt and pepper and garnish with chopped parsley before serving. This is an easy way to make a great tasting recipe.